The UL Lafayette Alumni Association Homecoming 2003 Ragin’ Road Race is right around the corner. Everyone is invited to participate in this 5K run/walk on Oct. 11. This race kicks off activities set for Homecoming day. The race starts and finishes near the UL Lafayette Alumni Center on East St. Mary Boulevard. Registration may be via mail to the Alumni Association, online at www.LOUISIANAalumni.org or on race day at the Alumni Center from 7:15 to 8 a.m. The race will begin promptly at 8 a.m. Awards will be given to the first and second place winners in each age division. Also, overall male and female, first and second place winners will be awarded. Age divisions include 14 and under, 15-19, 20-29, 30-39, 40-49, 50-59 and 60 and over. The race is being sponsored by Chummy Bourque, New York Life; Daniel R. Bourque, OB/GYN; Greg Bourque, Line X; Abita Springs and Piggly Wiggly. For more information about the Ragin’ Road Race or other Homecoming 2003 activities, contact the Alumni Association at 482-0900 or visit www.LOUISIANAalumni.org. 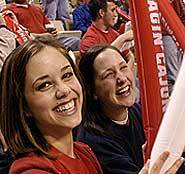 Louisiana’s Ragin’ Cajuns will take on ULM during Homecoming 2003. Kick off is set for 4 p.m. at Cajun Field.